Vacationing on the beachfront is something many people only dream about. Now there are more options than ever when it comes to finding the best option for families and couples who want to vacation together, and Rolling Surf Villa is one of those. Up to four couples can stay here in comfort. There is a hot tub, the beach is right there, and guests can enjoy nearby water sports and tennis. This beachfront villa brings guests closer to the water’s edge than ever imagined. 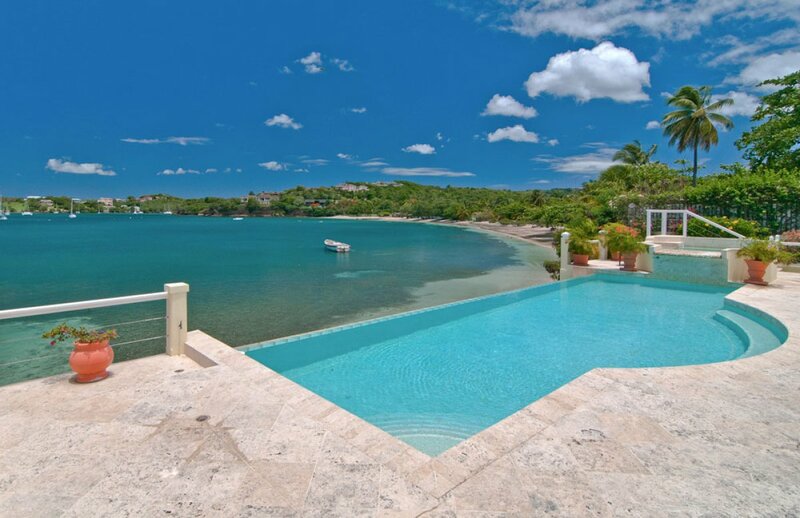 Bordering Prickly Bay, one of Grenada’s favorite anchorages, this is a superb stunning bespoke beachfront villa, it sleeps up to 8 guests in four en suite air conditioned bedrooms with ceiling fans installed for added comfort. The lower level is equipped with a media room and compact fitness area. Just as the name implies, sight and sound of the Caribbean waves gently lapping and rhythmically rolling onto the expansive soft sand beach will soothe away the stresses and strains of everyday life. The Master Bedroom is vast and includes a four poster super king sized bed, walk-in wardrobes and private balcony enjoying uninterrupted views of the ocean. The en suite bathroom has a whirl pool bath and walk-in shower, and a super high speed internet connection. Two further poolside bedrooms offer super king size beds and large bathrooms with wet room showers. One of these rooms can be configured as a twin if required. The self-contained en suite apartment is at a lower level and provides a super king size bed that can also be separated to create twin beds. The apartment kitchen is equipped with a range cooker, fridge/freezer, dishwasher & washing machine. All four bedrooms are equipped with cable TV’s. Natural shell stone floors throughout the living and leisure areas will encourage you to shed your shoes as you relax and take in the stunning views across L’Anse Aux Epines beach. Grenada offers an abundance of restaurants, ranging from fine dining to relaxed casual eateries serving local cuisine using home grown ingredients produced on the island. The Gary Rhodes Restaurant and Mark B’s lunchtime venue at the Calabash Hotel are just a short stroll along L’Anse Aux Epines beach from Rolling Surf. In addition a 5 minute walk to the Marina at Prickly Bay provides access to superb facilities including a mini mart, butcher, bakery, popular bar and probably the best thin crust pizzas to be found anywhere in the Caribbean. Upon arrival you will be welcomed by our housekeeping team who will provide cold drinks, a guest’s welcome pack and property familiarization tour. A light evening meal will be prepared on the day of arrival. The Grenadian people are renowned for their warmth and integrity, the staff will quietly and efficiently deal with your villa vacation needs. Guests will be met by the manager/Agent and taken the 10 minutes to the villa. Arrangements can be made for rental car to be delivered to villa. A welcome pack containing basic provisions of tea, coffee, soft drinks, bread, eggs, fruit, butter, milk etc., for your first breakfast and a light supper upon arrival for your first night. For safety reasons, children under 12 are not allowed. $1500 refundable damage deposit required per week. There are a number of cooks/chefs on the island who can provide dinner in the villa. Please ask for recommendations.